The Apple II computer didn't attract as many clones as the IBM PC, but the clone-makers the machine did attract often had pretty interesting second acts. The approximate number of Apple II Plus units produced by Apple under the Bell & Howell brand name, which was the only authorized clone Apple allowed of the Apple II in the United States—and it was nearly 20 years before Apple allowed for another company to resell clones of its machines in the U.S. The deal, announced in 1979, was basically Apple’s attempt to get a foothold in the education market; it worked. The Bell & Howell machines, produced by a company better known for making projectors, were interesting in that they were completely black, meaning Apple’s partner was making more stylish computers than Apple was for a time. This YouTube clip explains more. Is a piece of software copyrighted if it’s not printed out and is buried inside of a machine? This sounds like an obvious question—yes, of course it is—but wasn’t a question that had been asked before in a court of law. Surprisingly, it wasn’t a PC clone-maker that forced the question, but one making Apple II machines. Franklin Computer Corporation, a New Jersey firm spent the early '80s making Apple II clones that were close feature-wise with the original machines. The company also talked a big game, too. 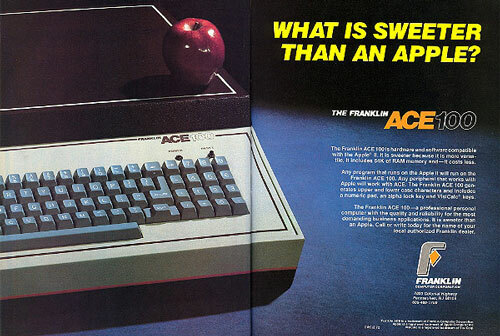 The reason why it worked so well had much to do with the way that Franklin copied the hardware and software necessary for the ACE 100—it did so wholesale, directly copying the hardware and software of the Apple II in an obvious way, while adding only a handful of minor additional features, such as the ability to create lower-case letters. In the case of the software in particular, the copying was so blatant that it essentially admitted doing so, claiming it would be infeasible for Franklin to reverse-engineer its own version of the Apple ROM software, and that it didn't need to anyway, because software programs are not subject to copyright, because the operating system software was utilitarian in nature, not expressive. It was a weird legal argument, one that allowed Franklin to make tens of millions of dollars off of an Apple knockoff using Apple’s own software. But it was one that took advantage of the fact that there was a gap in case law around this specific issue at the time. Understandably, Apple sued, unhappy about the precedent that it set. Even Steve Wozniak, generally a fan of efforts at compatibility and someone known for sharing the technical details of his work, spoke out in the press about the blatant nature of Franklin’s theft. A year later, an appeals court decisively agreed with Wozniak, creating an oft-cited piece of case law called Apple Computer, Inc. v. Franklin Computer Corp. that allowed software to be copyrighted in all cases. Apple actually lost the first round in a lower court, but the appeals court ruling was pretty hard to ignore. A January 1984 analysis of the case in the Golden Gate University Law Review points out that the legal decision helped to redefine our relationship with computer software, by ensuring that copyright laws made for the print era would still matter even when paper wasn’t the original medium. The Third Circuit's decision in Apple Computer, Inc. v. Franklin Computer Corporation is significant because it held that all computer programs, whether expressed in object code embedded in ROM or expressed as an operating program, are copyrightable subject matter. Thus, by granting copyright protection to all programs, the Franklin opinion has helped stabilize copyright law in relation to computer software and has allowed copyright to become the most effective, most easily obtainable, and most preferred form of legal protection· for computer programs. 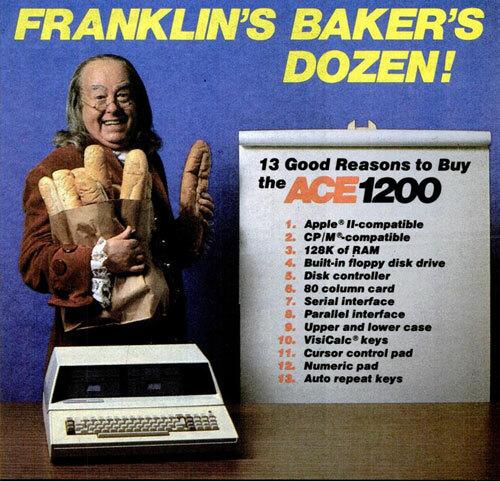 "I know, let's get a Ben Franklin lookalike to hold six loaves of bread while standing behind a computer and call it a baker's dozen. Makes total sense." And while Franklin Computer eventually cut a deal with Apple, it was not forced to immediately stop selling its machines, a partial victory in its own right, and one that gave the company time to comply with the order. By 1986, however, around the time Franklin had legitimately started reverse-engineering products, Apple’s legal pressure forced Franklin out of the PC market for good. Unfortunately for Apple, another competitor had figured out how to clone its Apple II platform the right way. The level of compatibility that the VTech Laser 128 shared with the Apple IIc Plus, according to Old-Computers.com. The Laser 128 was a hugely successful machine for what it was, and one that was legitimately reverse engineered in a clean-room environment, allowing the company to remain active on the market throughout the late ‘80s (despite Apple’s attempts to sue). The machine even sold at Sears, to the detriment of the Commodore 128. What’s interesting to me about both Franklin and VTech is that their respective experiences in the Apple clone space each proved informative to their later success stories on the general consumer market. Around the same time, each company moved away from Apple II clones and made a play for commodity electronics. While cloning a larger company’s computers made for a great way to get their feet wet in the computer industry, both Franklin (formed in 1981) and VTech (formed in 1976) were soon ready to do something more interesting. Another major win for VTech came in 1991, when the company, aware of the Federal Communications Commission’s recent decisions opening up spectrum originally used for television signals, created what turned out to be the first digital cordless phone on the 900 MHz frequency. To this day, VTech is a leader in both the cordless phone and educational toy markets, despite the fact that the two markets seemingly have very little in common. Meanwhile, Franklin, which was forced to diversify due to legal pressure from Apple and challenges from bankruptcy, found a niche it could work within by embracing the handheld computing market. The idea, per the Associated Press, went like this: Rather than accepting the idea that households would rely on one large computer, they instead pushed toward the market of numerous smaller ones. There were other companies that were hitting this niche, like Tiger Electronics, but they were focused on games. 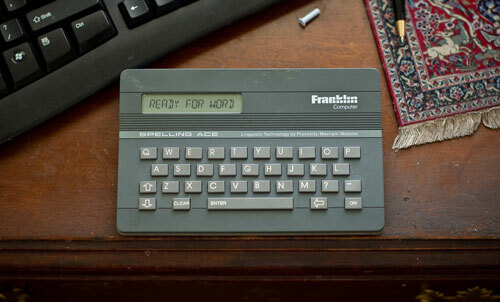 Franklin, instead, created more useful tools, starting in December of 1986 with the Spelling Ace, a small computer in which you could type in a word, and the machine would let you know the correct spelling. The basic idea extended to dictionaries and other tools as well. 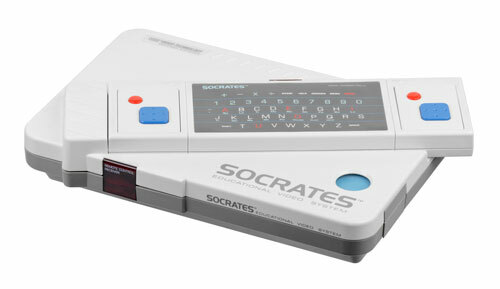 It was a simple, but powerful idea, and it led to lots of similar handheld computers from Franklin over the next two decades, including translators and handheld dictionaries. “This is sort of the Cabbage Patch of 1987. We haven't been able to build them fast enough," Franklin Executive Vice President Michael Strange told the AP in early 1988 after a successful holiday season. More colorfully, Franklin forged a sponsorship deal with Johnny Cash, having the Man in Black recite his favorite Bible passages in audio form. While the company sold the recitations in CD and cassette form as a way to promote its electronic bibles, the firm also found a way to integrate Johnny Cash’s voice with technology. "Working on this new product with the good people at Franklin has been a great source of inspiration for me and my family,” Cash said in 1999. Granted, neither VTech and Franklin ended up becoming Dell. In fact, both companies aren’t doing so hot these days. After a few mergers, Franklin’s website currently looks like this. And while VTech remains a going concern, it has become known more for hacking than hit toys. In a way, though, the fact that the Apple II clone market proved a dead end for both companies was good for consumers as a whole. Our digital lifestyles needed innovations both big and small—especially in the pre-smartphone era. Of the many interesting footnotes about the Apple II’s clone competition, perhaps the most interesting is the fact that in 1987, the fates of Franklin and VTech briefly coincided in a legal battle. Franklin argued that VTech’s Laser 128 was damaging the sales of its own clones, and that the Laser 128 was using software it owned the copyright to. 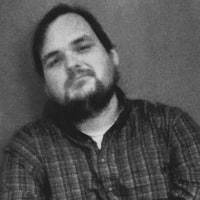 Central Point, the vendor that worked with both companies, denied Franklin’s allegations. As the article notes, Franklin wouldn’t have had a case at all had it not been accused of doing the exact same thing five years earlier, creating a legal precedent for software copyright.